A handful of people saw that there were alternatives to shopping and we took advantage of the tower being closed to launch from hard Runway 24, which was pleasantly smooth compared to the usual grass. A few aeros in the calm air and then a right hand circuit, just to make the most of being on the 'forbidden' side of the airfield. The occasional power traffic slotted in nicely without the need for ATC. There was also some model flying, including slope soarers and a jet. A very relaxing and enjoyable day. 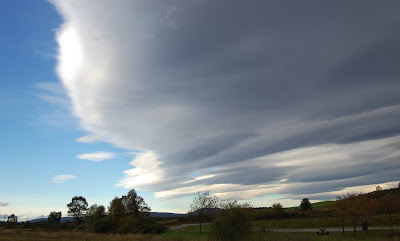 For some dramatic recent photos of wave clouds (lenticulars) over Yorkshire, take a look at http://www.bbc.co.uk/news/uk-england-leeds-16302606. The text refers to wave clouds as 'rare' and only occurring near large mountains like the Himalayas, we glider pilots of course know better. Though not as impressive as in these pics, wave occurs at Booker more often than you would think, especially in the winter when there are no pesky thermals to mess it up. Following on from Jim and Mike's adventure on Friday, FZA took off to clear sky but was cut off from the airfield by a snow shower that appeared from nowhere! 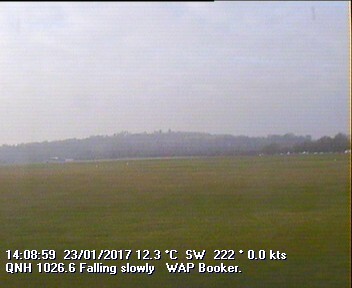 Rather than try to fly through the snow and sleet, height was maintained in the lift on the edge of the shower and a good field selected in plenty of time and a safe field landing made. The retrieve was made in near darkness as HNK had to be rigged to make room for FZA! In hopes that summer thermals soon would be there. While visions of final glides danced in their heads. Had just settled their brains for a long winter’s nap. I sprang from the clubhouse to see what was the matter. Gave Jim the idea, fly to the ridge at its best. But the Pawneee and K21 to the rear. I knew in a moment it must be St Heggy. Maintaining their height, 1400 feet at least. Crossing Risborough a doddle and then on to Halton. Setting course to the north what a wonderful ride. With height running out it’s not going well. As a hearty cry went out – I have control the flight it is over. A soft muddy landing for Mike and his sleigh. An epic rig by the FOGers to much cursing sweat and blood. He bashed into the tailplane – concussion, phew not dead! Sat flying school planes tied firm to the ground. But outcomes look up following a merge. When they meet with an obstacle, cloud showers in the sky. Field selection was good – winter wheat and not Sprout! "Now Cooling! now, Phelps! now, Parker and Herman! On, Williams! On, Hilary! On Davey and Richardson! To the trailer park! to the top of the wall! Now retrieve away! retrieve away! Retrieve away all!" With the trailer full of HNK! and trestles too. The mud thick and sticky their shoes they were clodded. It was time to head back to the old Grouse and Ale. Was an old man dressed in red standingever so bold. And away they all flew down the line of 24. Unable to help ourselves, Mike and I set off for the ridge on Friday once the cloud lifted high enough. Local ridge seemed to work OK to about 1300 so, despite the lack of a decent vario we started off toward Halton. Funny thing gliding...30 minutes flying, 3 hours retrieve, 3 hours cleaning and rerigging. What else would one want to do at the weekend?? Massive thanks to Heggy, Sue, and the ever resourceful Will for coming out to get us, Richard, Sarah, Glyn, and Steve B for helping clean and rig, and Mike for not being cross! 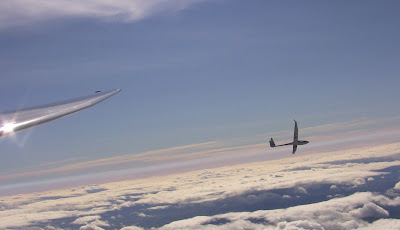 The list for Booker Gliding Club’s trip to the French Alps (Serres) next year will be going up on the notice board on Saturday the 17th December. The dates that are currently being planned for are the 9th – 23rd June. If you are interested please ensure you put your name on the list. This will again be an essentially two seater trip so if you are considering bringing your own glider please talk to Mike Collett, Doug Hilton and Geoff Tabbner. Due to the high-expected interest there will be a deposit of £150, which will be taken from your account. Any questions please feel free to ask. ....and a glorious sunny day, with plenty of action at Booker. 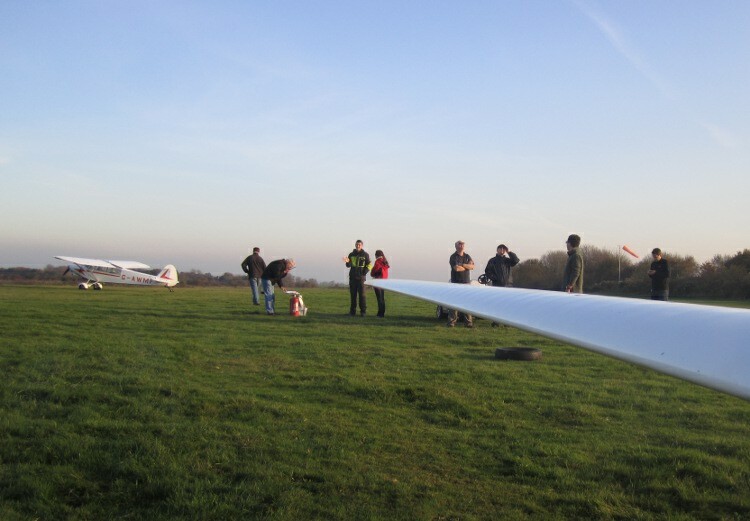 The FOG briefing on ground handling and the arcane art of glider parking was followed by a practical session on splicing, the participants all did very well. As to flying, there were instructor checks, aerobatics, members flying, and a visitor from Weston on the Green escaping from heavy objects falling from the sky at his usual airfield. The weather was ideal for all levels of experience. The end of the day saw an attempt on the record for the maximum number of people required to derig a K21. 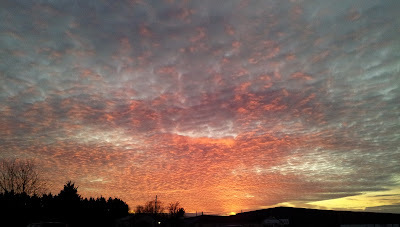 And then as we thawed out with hot tea in the clubhouse we were treated to a magnificent sunset. After last weeks days of low mist and fog, the weather has cleared each afternoon to be flyable and Friday has been particularly clear if somewhat breezy. This has enabled a fair amount of two seater training to take place plus several solo flights. The forecast for the weekend is good, so no excuses for not being there! A reminder that there will be a meeting from 10.00 am in the Clubhouse this Sunday 27th to discuss our operations during the period of the 2012 Olympic Airspace Restrictions. Your input will be very welcome. Other activities on the airfield included the fabulous noise from the Yak 11's radial engine as it was doing some high speed runs down the runway - hopefully it will be flying soon. The other slightly unusual activity was the sight of Doctor Who's Tardis flying around the north western end of the airfield - fortunately it was not being flown underneath a New Zealand helicopter delivering Christmas trees so we should be safe from the Daleks for a while yet. After a few days of very depressing low cloud and mist, the cold front went through around midday today and presented us with an excellent sky and visibility for the afternoon. Flights were taken by a couple of members in the K18 with the rest of the flying being taken by members on Basic and Intro courses. For a short period there were a couple of streets evident and one flight in the K21 managed 30 minutes soaring in the reduced sink that could be found under the cumulus - excellent considering the time of year and the fact that it was unflyable until 13:00. One note of caution for anyone flying with the low sun and low temperatures (especially on 24) is to ensure that canopies are spotlessly clean (as they should always be!) as visibility into sun is not always what it could be. Well, it was a bloody long way to Aerospool in Slovakia and back. I took a leisurely 3 days to go down through France, Belgium, Holland, Germany, and Austria -1122 miles from Booker. Despite that I managed to get nicked by German Hitler Yoof Politzei for overtaking a lorry where I should not have and then got stopped again in Slovakia for being foreign. Aerospool are an interesting company, very friendly and very busy. 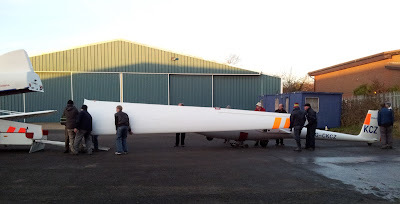 In addition to refinishing gliders they are completing gliders for Schempp Hirth for which they have the agency, building parts such as tailplanes for SH, and build nearly 500 Dynamics / year (The Dynamic is a very nicely designed and built Rotax powered ultralight which can aerotow two seaters and cruise at 250KPH). They have a nice airfield with a flying club just W of the Tatra mountains and say that the soaring in March and April is very good. We have an invite for an expedition! The highlight of the tour was however the German motorised toilet. So good in fact that I had to bring you home a video! 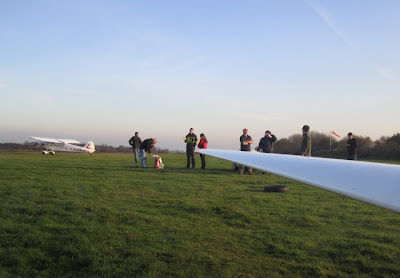 More warm November sunshine today - our hardier members were in T shirts - and plenty of flying, with a mix of trial lessons, course flying and members just having fun. With Graham around this of course included aerobatics, one of the K13s did most of one downwind leg looping. .........but looking down was just fine! 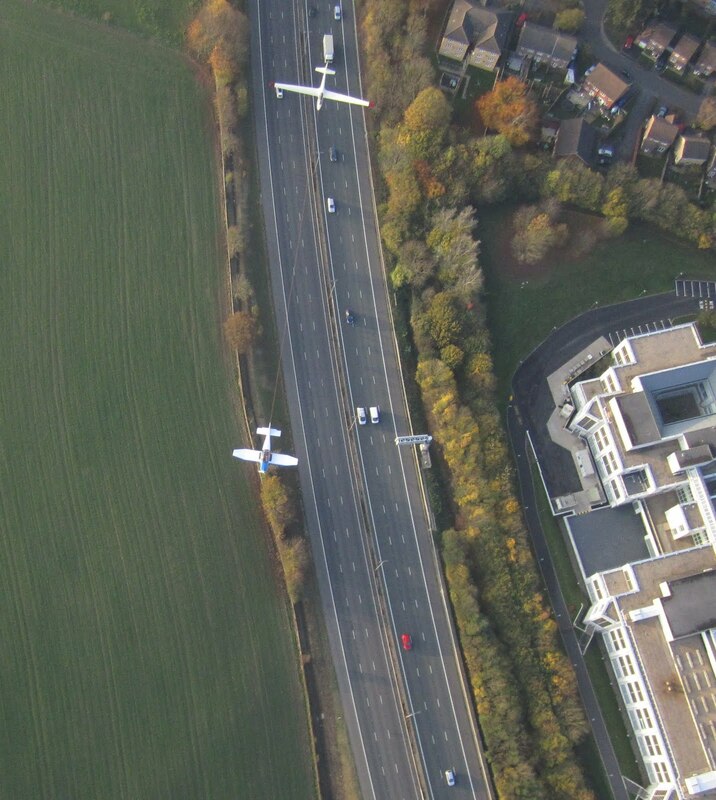 Bob Smith went for a flight in order to take some photos for his forthcoming FOG (Fundamentals of Gliding) briefing which will include tips on cable break options. 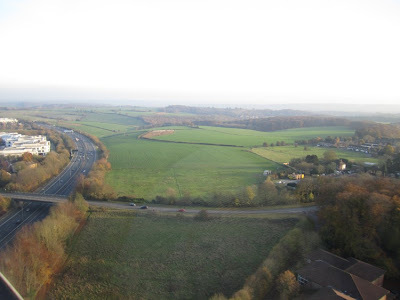 Come along on Saturday 26 November at 0930 for a discussion on the fields shown below. Better still, come at 0845 and help unpack the hangar first. 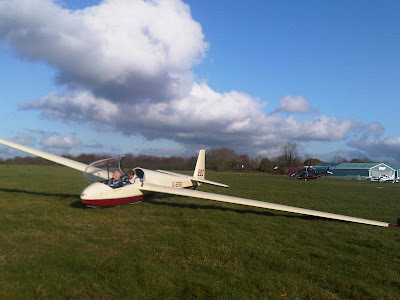 Before anyone thinks we have lost the plot, Booker is still first and foremost a Gliding Club, however every now and again there is the need to do some necessary husbandry around the launch point and airfield boundaries. There was an incredible turnout of members complete with a wide variety of loppers, chain saws and parangs who under Will Ellis' direction set about clearing part of the boundary on the south west corner of the airfield and a massive cleanup around the launch point and trailer park. It was very refreshing to see so many willing workers who stuck with it all day. An impromptu barbecue was provided by Marnie and Dave Humprey to feed the masses for lunch which was extremely well received. Be warned there are more 'work parties' planned as there is still lots more to do but the effort is well worth it for the benefits you will get - please be willing to do your bit - notices will be put up and sent out for further dates. A BIG thank you to all those who turned up and helped out, it is really appreciated. With regard to flying, there is still plenty of activity weather permitting - the Aerobatics weekends are running as well as more general training, soaring and other activities planned. The strong southerly wind over the weekend made every take off and landing one with a full on 90 degree cross wind but all the pilots who flew rose to the challenge and acquitted themselves admirably. This was one of the few weekends where the use of runway 17 might have been an advantage, on Sunday the wind was obviously sufficiently challenging for the power traffic to not bother as there were virtually no power planes operating all day. Saturday produced some good soaring conditions in the afternoon which went on quite late but honours for the day go to Mark Wolfe who rigged his Libelle and had a good soaring flight. Sunday was windier with a Met Office Strong Wind warning with 25 knot gusts predicted. Fortunately the gusts didn't affect us but as most people found out, the upper wind was definitely in the region of 40 knots as forecast. On the plus side though, there was a lot of wave about and climbs of 2/4 knots were to be found. Unfortunately one of the stronger wave bars was aligned east west just south of the 2500' airspace boundary and the climb had to be abandoned so we never found out how high it went! Whilst many members have been enjoying the delights of Aboyne's wave, the Indian Summer has produced many good flying days at Booker. 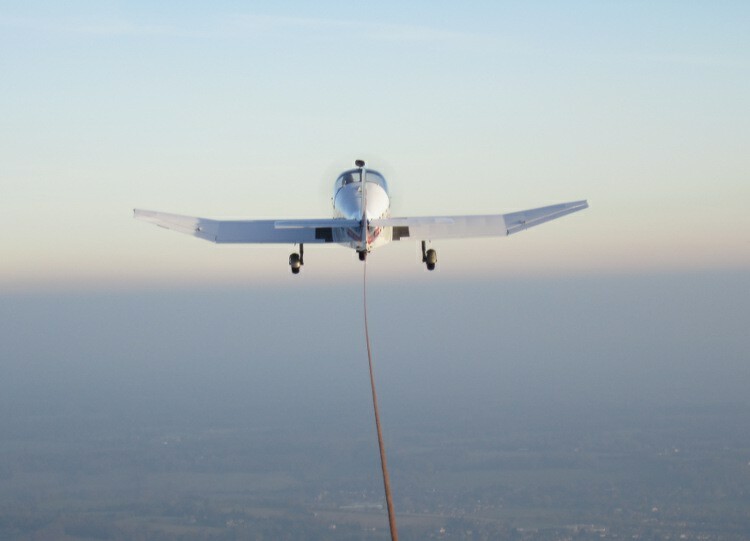 The end of last week saw several days with multiple soaring flights averaging 90 minutes occurring. The weather was good enough to see a reasonable level of activity in the trailer park and gliders being rigged to take advantage of the weather. There was a mixture of good thermals with strong climbs (under a low cloud base) and some weak wave that was working up to 3,000ft. Saturday was another good day and the launch point looked more like the middle of summer than the middle of October with nearly 40 launches throughout the day. Congratulations to Booker Cadet Ben Followell who went solo in EBZ on Sunday. Something is very odd though when you are still wondering around in tee shirts and shorts and then go into John Lewis to be surrounded by Christmas decorations?? More wave flying today. Congratulations to Rob Kehr on a good solo flight in 318 climbing to 6,450. It doesn't sound very high, but this was about the best anyone did in the cloudy conditions. We launched early and had magnificent views towards Aberdeen with a gap up the Dee Valley and line of wave smoothed cumulus all the way from Aboyne out to Braemar. The most notable feature today was the low launch heights needed to get into the wave, some pilots managing to get away with releasing at 1100 feet. Everybody flew today and there were a number of flights over five hours. Cloud at many layers prevented any good climbs, but William Parker found an edge over Glen Tanar and then a few climbed to 8,000 ft or more. Great pic from Rob K that shows the East-West wave bar with a line of cumulus leading off towards Aberdeen. You can also see the layer of cloud at 6,000 feet that stopped many from getting any higher. 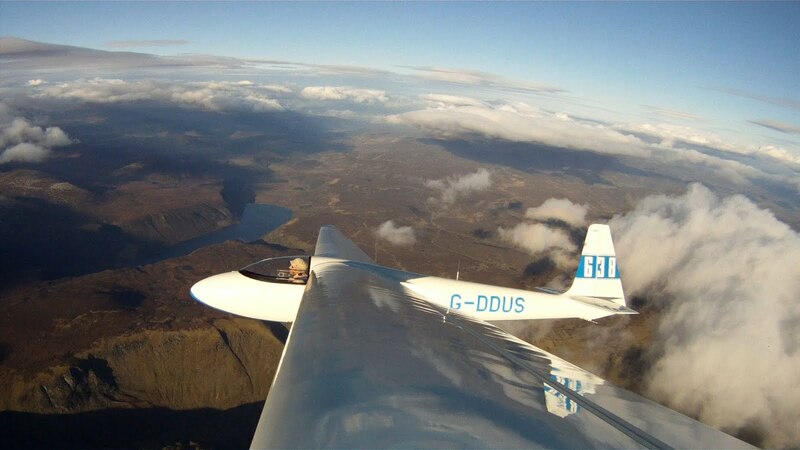 Despite the weaker climbs and lower cloudbase, Jane 118 still made it out to Braemar, but don't let J1M know. We ended the day with some radio controlled rocketry, which entertained locals and visitors alike. Photo taken by Rolf a couple of days ago. Barry Michael waiting to launch in JDV. Proof that there is a DG300 at the end of the rainbow. Wednesday and Thursday have been a little quieter and those that have been looking at the synoptics will know that we are stuck with some slack weather. Hopefully the wind will return soon. 315 has been doing some circuit training and Rob Kehr has just returned from a short flight in evening wave and a T shirt, Jeremy has just launched with another 25 minutes until sunset. Yesterday John H, Heggie, Glyn and Phil went fishing in a boat on the loch at Glen Tanar, we still don't know whether they caught anything. Jim has been practising his golf swing. Today everyone has been off walking around Loch Kinord and up Burn o'Vat. 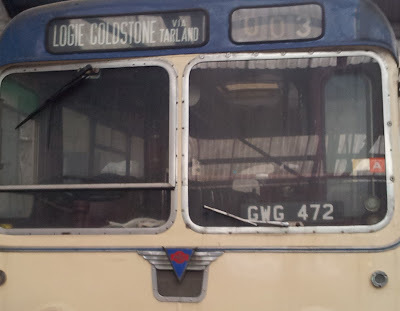 Some of us went to the outdoor clothing shop in Ballater for lunch and spotted this old bus in the depot. The destination board pretty much described our flying tasks for this week (sorry, you have to know the local landmarks to get this one). A good forecast for Tuesday but the showers appeared again. Despite this, the wave kept working and people were climbing above 10,000 feet all day long. Everyone from Booker flew today except for JDV. As the pic below from Rob Kehr shows, there were times when it was difficult to avoid the clouds, and this morning the clouds kept forming between 3,000 ft and 9,000ft. It was a bit like climbing up the middle of a packet of polos. Congratulations to Steve Williams on his first solo in the Pegase (yesterday). His briefings for other first Peg solos should now be even better. Steve 318, John HXH, Phil 315, Rolf 318, Rob 315, Bob 208, Bob 279, Sarah 315, Jane 118, Richard 2R, Dave 315, Denis 370, William LC, Graham 315, all had good flights. Pete Wyld and Adrian Hegner spent the day towing. Glyn was exploring other interests at the Black Faced Sheep tea rooms. Geoff flew off in his RV and we wait to find out whether he got through the band of rain that is forecast to be across Northern England for the next few days. 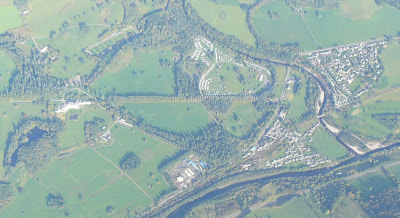 J1M at 11,000 feet over Aboyne Airfield. We have our third badge claim with Jim White climbing high over the airfield for a Gold Height. A few of the gang got high, but above 12,000 feet the winds increased above 70 Kts, and any cross country had to be at a lower altitude. Denis went to Killin on Loch Tay. Jane and Richard went to Braemar, Richard getting to 16,000 feet. Bob S flew for about seven hours for his second Silver duration flight of the week. The wave is still working and the airfield is busier this week with a bigger contingent from Lasham also on site. Some of us have held on at Aboyne for another week. Dave Byass is now wave bashing in 315 with the newcomers, and all have had at least one wave flight. 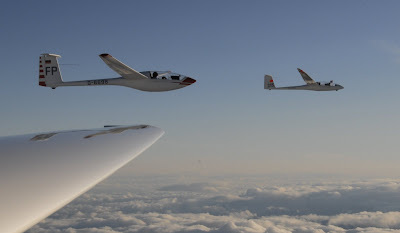 Rob Kehr's first experience of Aboyne was a 12,000 foot wave flight. Mike C took a break today by flying his own glider, HA, around the Don Valley. There has still been a fair bit of cloud around, but there has been good wave and it has been possible to get high on both Sunday and Monday. The local hot spot of Logie Coldstone still the favoured release point. Today we had our second badge claim, a Gold Height, Jeremy Gilbey taking FGT to 15,000 feet over Dinnet. 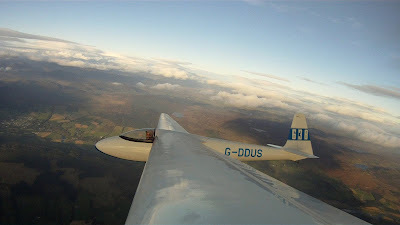 The expedition to Aboyne seems to be having a fantastic time with some brilliant flying and socialising afterwards - all things that make being a part of Booker Gliding Club so worthwhile. Keep giving us the updates! Life and flying continues at Booker (albeit without the sunshine and wave), flying has continued this week in spite of the very strong winds with a lot of training and several soaring flights in rough and turbulent thermals. Saturday with lighter winds produced a day of general training and a bit of a wait whilst the Goodyear Airship navigated its way through the ATZ. Loch Muich from the K6 wing cam. Friday turned out to be another good wave day, although most didn't launch until mid afternoon. Mike and Graham set off for Loch Tay in 315, Will and Denis declaring the same task, the Ventus Turbo turned back, but the K6 made it. The K6 was also the last landing at 18:45. As always with the Autumn flying at Aboyne there were some great sunset views through the clouds late in the day. Changeover day today, we did have eighteen club members here yesterday, Geoff Tabbner making the hop from Chiltern Park in his RV6. Dinner in Birkelunn steak, chips, peas and onions or an indian from the new restaurant in Ballater. Those lucky enough to be staying in Birkelunn have also been treated to Rolf Kern's pastry making skills with the Kern signature dish, tarte tatin, and chocolate bread and butter pudding. Link to the BGA height ladder for flights. There is so much flying going on here at Aboyne that we are losing track of who is doing what. Lots of flying on Wednesday and Will could be seen at 22,000 feet in his K6; this flight qualified for a Diamond, but Will is unwilling to sponsor the BGA with the claim fee. See the BGA ladder as most of the flights are appearing when we get the time to load them. Booker GC is leading the height ladder and it doesn't look like anyone is going to catch us. First flights today had a great view of the first snow on the Cairngorms, but the low wave faded away at lunchtime and most landed back. Another round of flights above 10,000 feet in the afternoon, with 315 launching for 90 minute flights all day long. 318 has been busy with Ashley and Rolf flying this morning and Robert Turner flying it out to Loch Muick this evening. Some great air-to-air shots from our new friends from the gliding club at Bremen. Attention seeking 315 crept up and got into the shots. Adrian Hegner arrived yesterday, but despite this the weather is still good. Glyn has booked first flight of the day in 315 tomorrow so there must be more good wave on the way. Toad in the hole at Birkellun! Another good wave day North of the border. A little too windy for cross country with 60 Kts at 15,000 feet and lots of height lost when crossing in-to-wind wave bars. Lots of flights, with 315 going well above 10k on five flights. Cloudbase was 4k and the gaps kept easing closed only to open up again. A few of us climbing to around 15k in the strong lift then descending below cloudbase only to repeat the fun later. Best climbs, as so often, just North of the lochs. Some launched late in the day for some filming, the results are in the editing suite, hopefully there will be a new Aboyne video soon. Daily heights and flights, provisional. (Flights will be on the ladder soon). Barry, JDV, 19,200ft, not quite a Diamond. As I write this on Weds morning, 315 is climbing in wave for the second time today and 118 has just launched, so we're all off to do it again. Rolf has arrived taking Booker numbers up to fifteen and the forecast is looking good for a busy few days. 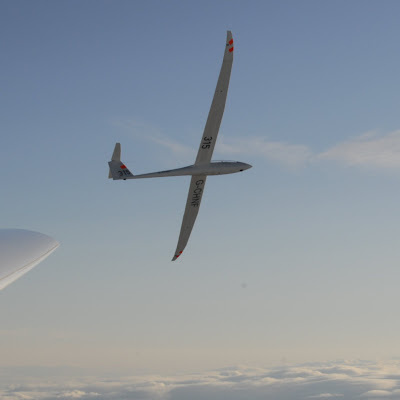 Over the weekend the first group of fourteen Booker pilots arrived at Deeside Gliding club for the annual wave soaring expedition. Sunday was wet, but it dried out enough for the first round of model flying. Will Ellis demonstrating his electrified Discus, Pete Wyld dug out his micro video camera and we taped it to the Cub. In flight video to follow. 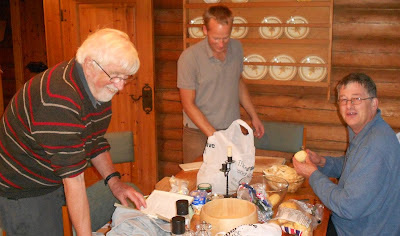 In the evening we had the first group dinner in Birkelunn; we know how keen our blog readers are to hear about the culinary aspects of any expedition. A Roast Beef dinner of the finest quality, ten out of ten for Chefs Will and Graham. Will's melt-in-the-mouth steamed treacle and marmalade pudding ensuring that we met our daily calorie allowance. Monday was the first flying day. A classic wave sky (see the photos). Team Booker were first to rig despite not arriving till 08:30, Ashley and Mike launching around 9 in 315. After a few fettling issues for some private owners most flew. The roll call of achievements follows. Bob D, 208, 17,623 ft over the lochs. Mike & Ashley, 315. 10,000 feet, Lochnagar then Braemar. Denis, 370, 10,000 ft, Lochnagar then Braemar. Jane, 118, Flat tyre, barograph inop, oxygen broke, then 10,500 Ft over Cambus o May. 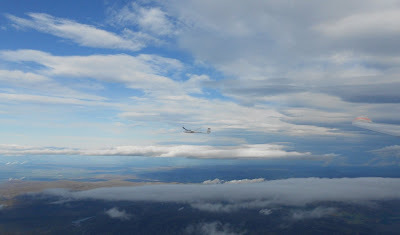 Will, 10,000 ft, Lochnagar & Braemar - Distance flight of the day! 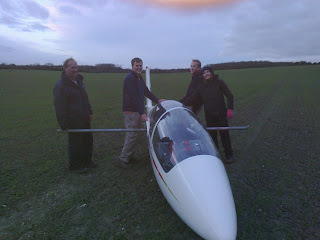 Will is flying his K6 and the wind at 6,000 feet was 50 Knots SW! The circuits were sporty, and we packed up when the cloud arrived after lunch. Not sure about tomorrow, the wind may be too strong, but might be OK with an early start. Photos courtesy of Ashley Birkbeck and Robert Turner. With headlines like that I should be consigned to the News of the World - lucky it is no more. September really did deliver an Indian Summer and there were only 4 days in September when the club didn't fly. Over 450 launches were achieved during the month that inlcuded several cross country flights late into the month and a significant amount of soaring. Several instructors have been frantically getting hours in before renewals expire (the message here is to do it sooner!) and the Bronze course run by Richard C was a success with Phil Binnee and John Lambe getting their Bronze badges, 1st solo for Neil Parkinson and type conversions with Ali Elliott on the K18 and Sam Gervais on the Junior. This list doesn't include the other achievements already mentioned in earlier September Blogs. Jonathan Morris chose Booker as the best place to learn aerobatics having been awarded an Air League scholarship and went away having achieved his Basic level award under Graham Saw's excellent tuition. The 1st October arrived hot and sunny and even though a large contingent of the club are wending their way to Aboyne, there were still 38 launches on one of hottest October days known. The sunshine brought out the T21 and all the flying was done in shirtsleves.